Augusta National has pushed Tiger Woods and Rory McIlroy off the box cover of Tiger Woods PGA Tour 12. Woods has featured on every cover of the game since 1999 and last year shared it with Ulser sensation McIlroy. But with Augusta finally coming to the video game market, the course itself has been given the starring role this year. According to Eurogamer.com, EA Sports president Peter Moore denies that that the company is trying to disassociate itself from Tiger’s tarnished image. “We like everybody else that’s involved with Tiger and the game of golf in general, the Augusta club, are all anticipating a great year for golf this year and Tiger being very important in that,” Moore said in response to a question from Eurogamer in a conference call this evening. “Obviously it was a difficult year last year, but you saw towards the end of the season Tiger starting to get back to his old ways. We all as both a sports industry and sports fans are hopeful he comes back in full force in 2011. “He is on the PS3 version of the game [Collector’s Edition]. Our focus this year for this particular release is the Masters itself. You can see the iconic flag as part of the box art. “If the insinuation is it’s a reflection of EA Sports backing away from its relationship that goes back literally 13 years with Tiger, that’s not the case whatsoever. This is obviously a very important day in our history and an important day in the world of golf videogames, and focusing on the Masters is the right thing to do. “But Tiger is right there on the PS3 version of the game with Move support, which was very good for us and Sony last year. We’ll continue that. Rory McIlroy took another step towards taking over from Tiger Woods as the face of world golf when Electronic Arts Inc. announced on Monday that the Holywood star is now the cover athlete and namesake of its golf franchise. Fearless Rory McIlroy believes he can smash Tiger Woods’ record and become the youngest Masters champion in history. Rory McIlroy took another giant step in his career when EA Sports announced he would feature with Tiger Woods on the cover the world No 1’s new PGA Tour ‘11 video game. 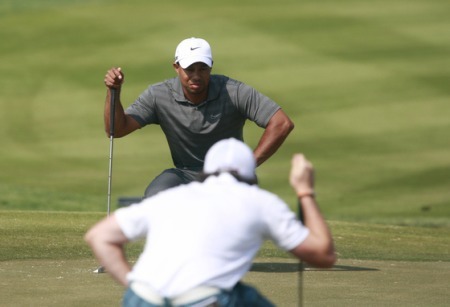 Tiger Woods and Rory McIlroy will be keeping an eye out for each other this week. Photo Eoin Clarke/www.golffile.ieRory McIlroy has a major advantage over Tiger Woods as he bids to capture his first green jacket this week. It’s not his length off the tee, hit towering iron shots or his fearless short game but something as elusive as time itself.